British artist Lucy Williams redefines the concept of collage through her intricate mixed media bas-reliefs depicting deserted scenes of mid 20th century Modernist architecture. Her works are a fine balance: structurally and in the tension between the precision and masculinity of the stark utopian architecture that is re-invested with humanity through the painstaking and traditionally feminine domain of craft. Ultimately, Williams’s primary interest lies in the interplay of representation that the Modernist source material so lends itself to in descriptions of geometric and modular blocks of material and colour. Born in Oxford in 1972, Williams studied at Glasgow School of Fine Art before obtaining a Postgraduate Diploma in Fine Art at the Royal Academy in 2003. 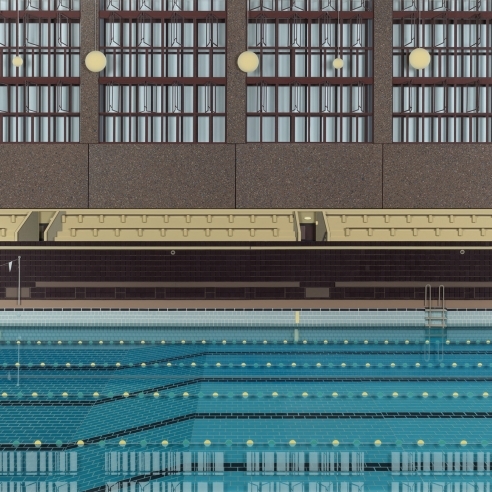 She has exhibited internationally with solo shows including Beneath a woollen sky and Pavilion, both at Timothy Taylor Gallery, London (2007 and 2012 respectively), Festival at McKee Gallery, New York (2014), and most recently with Lucy Williams: Pools at Berggruen Gallery, San Francisco (2017). Group shows have included Painting the Glass House: Artists Revisit Modern Architecture, The Aldrich Contemporary Art Museum, Ridgefield, Connecticut (2008) and After curated by Marjolaine Levy at Galerie Mitterand, Paris (2013).